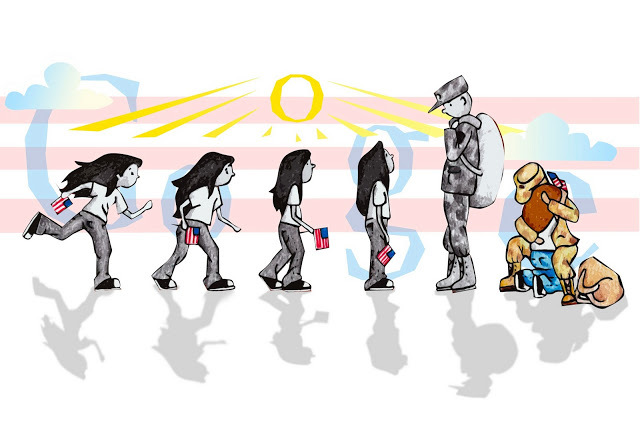 Doodle 4 Google 2013 Winner : Sabrina Brady For "Coming Home"
If you visit Google today, on their home page is a special Google Logo, aka Doodle, created by Sabrina Brady of Sparta, Wisconsin. Her Doodle won out the competition this year for the Doodle 4 Google award. The contest was "My Best Day Ever..." and Sabrina described her best day ever in this Doodle. Her Doodle told the story of her reunion with her father as he returned from an 18-month deployment in Iraq. How heart warming. Not only is her Doodle on the Google home page for millions to see, but also she will be receiving a $30,000 college scholarship, a Chromebook computer and a $50,000 technology grant for her school. Congrats Sabrina and I bet this is your second best day ever! To see the other finalists, see the Google Blog. Forum discussion at Google Web Search Help & Google+.